An Iranian photojournalist speaks against President Donald Trump's use of one of her photos in a tweet in which the president promoted a "brighter future"
Yalda Moaiery, 37, who lives in Iran's capital, Tehran, wrote in an Instagram post this week that she took the photo of a woman during public protests more than a year ago around the University of Tehran. Moaiery told NBC News that she did not license or otherwise grant permission to the White House or any other part of the US government to use the image. The White House did not immediately respond to a request for comment, and it is not clear how the image included in the Trump's tweet was obtained. "40 years of corruption, 40 years of repression," the president tweeted. 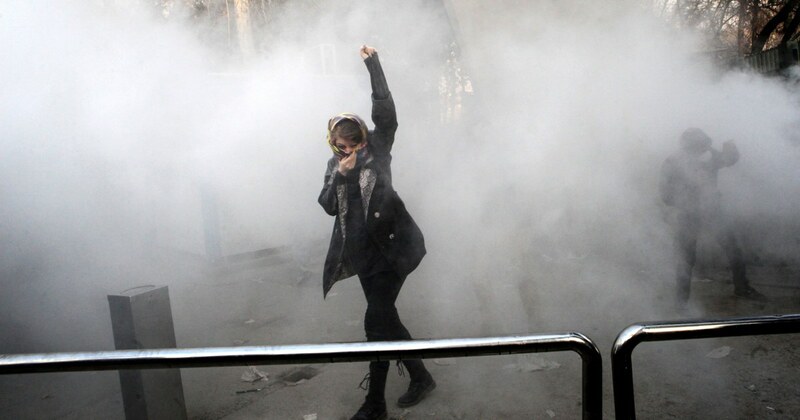 "The long-suffering Iranian people deserve a much brighter future." "People are being crushed and ruined in Iran by all of its policies," the photographer told NBC News on Tuesday in an interview in Farsi. "We have a lot of problems and a lot of that is because of Trump." "It was my brother's engagement, and my parents could not come here for it," Moaiery said. "The travel ban has put a gap between our family." The photographer, who has captured the scenes of the war in Iraq and Afghanistan over her 20-year career, took the now-iconic photo when protests over the country's economic problems broke out in late 2017. The image was published by major US and international publications. "I was not able to reveal my identity for six months because I thought that being known as a photographer I could get into trouble, "she wrote in her post. "But I came out as it is important to show the situation in Iran in a clear and transparent way." "Iranians simply do not see honorable intentions from Trump," said Trita Parsi, author of the book, "Losing an Enemy – Obama , Iran and the Triumph of Diplomacy. " "We are working diligently to make sure we support the Iranian people and that we direct our activity towards ensuring that the maligned behavior of Islamic Republic of Iran is changed," Pompeo said. "That's the goal." But Moaiery told NBC News: "Our daily life is what has been impacted by most of the sanctions on Iran. It has completely taken over people's lives and ability to provide and live high-quality of life. "